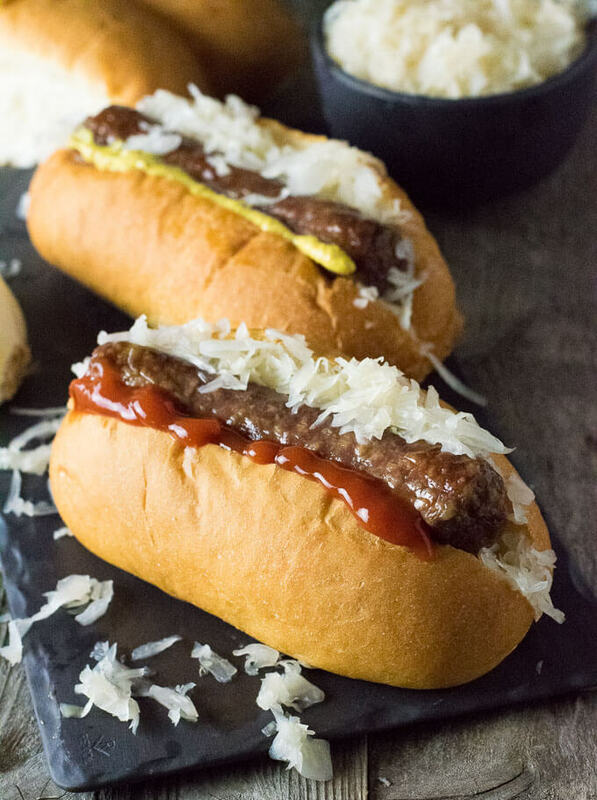 Smoked brats are possibly the easiest bratwurst to prepare. This method is almost full-proof, yet each juicy bite is completely soaked in flavor. Honestly, I discovered this recipe because I was feeling lazy. I wanted to have a cookout but I didn’t feel like tending to a hot grill. Instead, I just fired up my smoker and threw the brats inside and ignored them until they reached 160 degrees of smokey heaven. It was love at first bite. 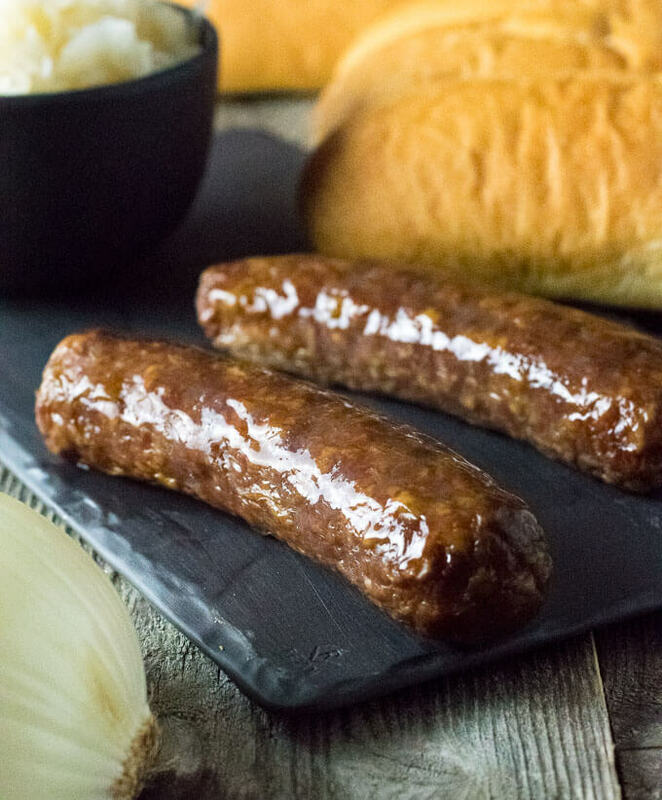 Smoked brats are gently cooked in a smoker, rather than on a searing hot grill. 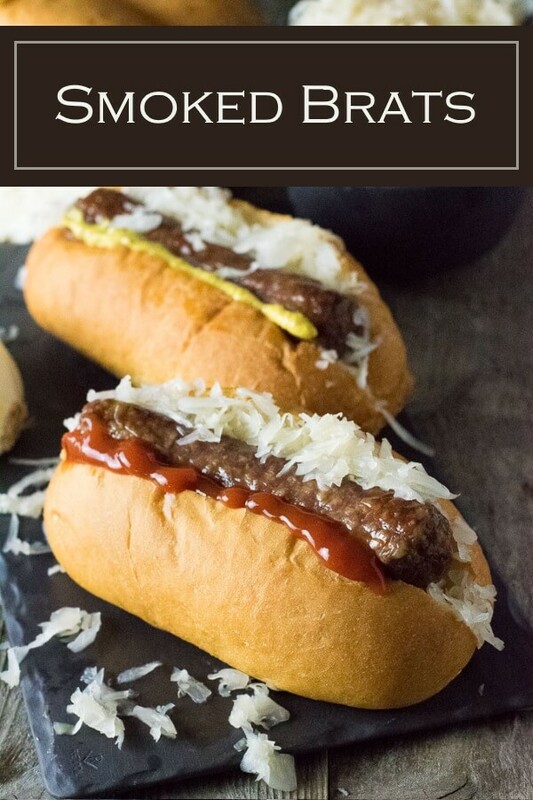 The main benefit this provides is the gentle heat helps prevent the bratwurst casing from bursting and all of the juice running out, as is often the case on the grill. For tips on how to avoid this, read How to Grill Brats. I have used a charcoal smoker for a number of years, and love the flavor it imparts, however, I recently switched to this electric smoker (affiliate link) and couldn’t be happier. The set it and forget it ease of use makes me use it far more than I wanted to fuss with the charcoal smoker. I literally just turn it on, add wood chips, set the brats inside, and wait for the meat probe to reach 160 degrees. Smoke brats at 225 degrees. Many smokers fluctuate temperature, or are hard to set to a specific temp, but don’t be overly concerned. As long as you are in the ballpark of 225 degrees you will be fine. Just try to keep the temperature below 275 degrees, but keep in mind if the temperature is running a bit high, your cook time will be reduced. Smoked brats cooking at 225 degrees takes approximately 1 hour and 45 minutes to fully cook. The exact cook time will vary depending on how much your smoker fluctuates the temperature. My favorite way to keep brats warm is using the classic Wisconsin beer brat bath. If you aren’t familiar with this, it is basically a pan of beer simmering with onions that the brats linger in until served. You can set the pan over a warm grill, or it can be held on the stovetop instead. Keep it at a warm temperature, too hot and the brats will keep cooking. A bratwurst isn’t complete without all of the fixin’s. 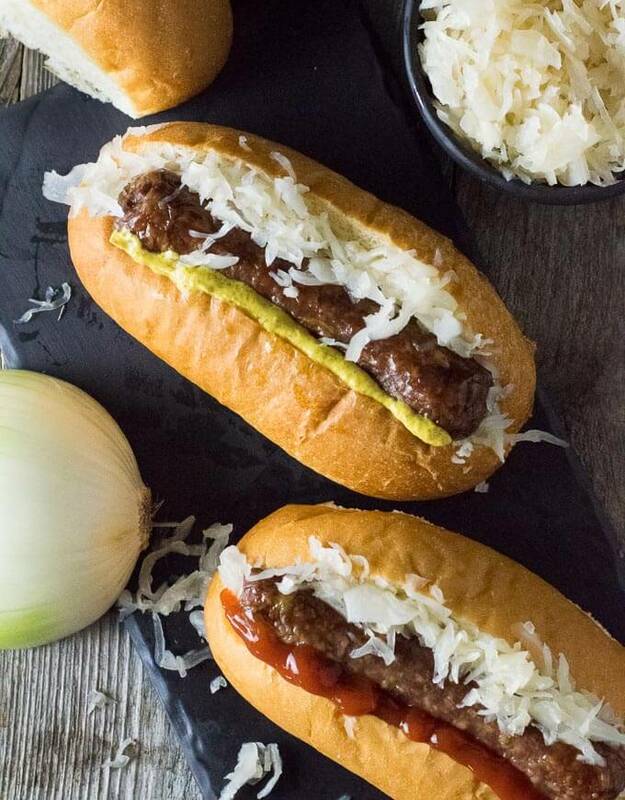 Serve chopped onions and sauerkraut with your brats. Bonus points if it is homemade sauerkraut! Ketchup and mustard are the recommended condiments for brats, although some purists will try to convince you ketchup doesn’t go on brats. However, rest assured even here in the brat mecca of Wisconsin, most everyone uses ketchup. 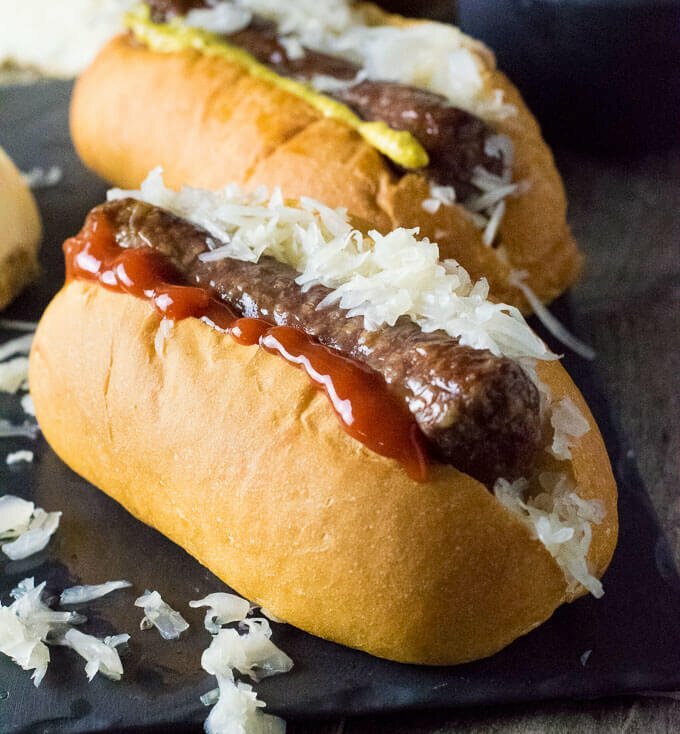 You can use yellow mustard, but your favorite gourmet mustard is right at home on most brats too! Place brats inside the smoker and let cook until the interior of the brat reaches 160 degrees. This should take 1 hour and 45 minutes – 2 hours. 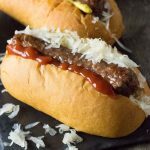 Serve these with Homemade Baked Beans, Classic Macaroni Salad, and Homemade Cole Slaw for a complete cookout!